Leonard Brigstock, a 33 yr old stoker Petty Officer of HMS Arethusa then in Chatham Dockyard, was incensed that CPO Herbert Deggan had charged him with three relatively minor breaches of naval discipline. It being Saturday , Brigstock went into Chatham where he had some drinks, although witnesses would say that he was still sober when he returned to the ship. He went to Deggan's mess and found the CPO lying in his bunk. He cut Deggan's throat so violently that the head was almost severed . Brigstock then went to another mess carrying the bloody razor and spoke to another PO " Here Ted " he said " I've cut that CPO's throat "
When charged , Brigstock said " I didn't know what I was doing.... I didn't do it maliciously . Not as far as I know " . At his trial later in the month two of Brigstocks brothers, both constables in the Metropolitan Police, gave evidence of his strange behaviour, but the senior medical officer of Brixton Prison, called by the prosecution, said he had kept Brigstock under observation and he could find no evidence that he was insane when he committed the murder. Brigstock was hanged at Wandsworth on 2nd April. Taken from A Grim Almanac of Kent . by W H Johnson. A very harrowing account on both sides. Thank you Kyn for posting this and my sympathy to all living relatives of both men involved. I had trouble reading this post. Thanks again. Messrs. Ellis and Ellis, the Maidstone solicitors who have acted for Stoker Petty Officer Brigstock, who was sentenced to death for the murder of Chief Petty Officer Deggan o board H.M.S. Marshal Soult at Chatham last January, were informed by the Home Office on Saturday that that additional evidence submitted by them has been considered, together with reports from two additional doctors, and a reprieve refused. The Home Secretary sees no reason to interfere with the course of justice. Brigstock’s appeal against the conviction was dismissed by the Court of Criminal Appeal on March 18. The execution will take place to-morrow. There were remarkable scenes near Wandsworth Prison yesterday when the execution took place of Stoker Petty Officer Leonard Albert Brigstock, aged 33, of Nelson Road, Chatham, for the murder of Chief Petty Officer Deggan on board the H.M.S. Marshal Soult, a monitor, at Chatham on January 19. Three aeroplanes, from which floated streamers bearing the words, “Stop the Death Sentence,” circled over the prison; vans fitted with loudspeakers broadcast the hymn “Abide with Me”; about 50 men carried sandwich boards protesting against capital punishment; and at the time fixed for the execution a woman knelt and recited the Lord’s Prayer. Mrs. Van der Elst addressed the crowd. Several police officers spoke to her, and then drew a cordon across the road to stop the procession of loud-speaker vans. Mrs. Van der Elst afterwards stated that she had been up all night trying to get additional evidence on behalf of Brigstock, but had failed to get in touch with the man she wanted. She added that she would get worse and worse. She intended to get another permanent organization, and the membership would grow. At the inquest on the body of Brigstock it was stated that the execution had been carried out expeditiously, death being instantaneous, and the jury returned a verdict that he died by judicial execution. 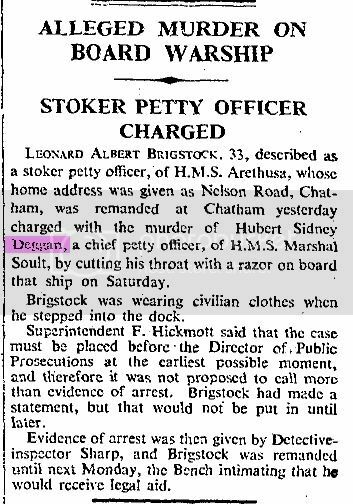 The Court dismissed the appeal against conviction of Leonard Albert Brigstock, stoker petty officer, who was recently convicted at Maidstone Assizes of the murder of Chief Petty Officer Hubert Sidney Deggan by cutting his throat with a razor on board H.M.S. Marshal Soult last January. Mr. J.D. Cassels, K.C. (who appeared for Brigstock with Mr. H.J. Baxter) said that on January 18 last Brigstock was reported by Deggan for a deviation from duty in connexion with the discipline of the ship, and he was taken before the lieutenant-commander. Deggan made a statement, and Brigstock was informed that the matter would be reported to the captain. Brigstock then went on week-end leave. He went home and visited with another man a public house, where he drank a not excessive quantity of beer. Then he returned home, got a razor, went back to the Marshal Soult, made his way to the mess, found Deggan there alone and, apparently, asleep, and cut his throat with such force as almost to cut his head off. Then he went into another mess, where he awakened a man and told him what he had done. At the trial the defence of insanity was set up, and evidence was given of the mental condition of certain relatives of Brigstock and also of his behaviour on various occasions. In rebuttal the master-at-arms stated that Brigstock had carried out his duties without complaint and that he had never noticed anything peculiar about him. Evidence was also given by the prison medical authorities that Brigstock showed no signs of insanity. No complaint could be made about the summing-up of the Lord Chief Justice, but Brigstock wished to call certain fresh evidence. One of the proposed witnesses would say that he had served with Brigstock in ships in the past, and incidents had occurred which led him to the conclusion that Brigstock was not right in his mind. Another man would state that on one occasion, while they were in China, Brigstock showed him a star tattooed on his chest which he said was the Star of Bethlehem, and was the emblem of a secret society to which he belonged, one of the objects of which was to kill persons whom they regarded as enemies. A third witness would be a doctor, who would say that Brigstock suffered from delusional insanity. Mr. Frank Powell, for the Crown, was not called on. Mr. Justice Avory, in giving the judgement of the court, said that the sole question was whether the Court should entertain on the question of Brigstock’s responsibility in law for the act which he undisputably did. There was no doubt that, having a grievance against Deggan, who had reported him for breach of duty, Brigstock had armed himself with a razor, had gone to the mess where Deggan was apparently asleep, and had cut his throat. After that act Brigstock made statements which showed that he perfectly appreciated what he had done. At the trial the defence of insanity was definitely raised and witnesses were called with regard to it. The jury nevertheless found Brigstock guilty. The Court did not sit to retry cases where there was no complaint of the misreception of evidence, or of misdirection of non-direction by the Judge. The only course which the Court could take in the present case was to say that they could not interfere with the verdict. They did not think it right to entertain the evidence of fresh witnesses on the same subject-matter as had been dealt with at the trial. It was essentially a case in which the whole question should be considered by the Home Office, and the appeal would be dismissed. Sentence of death was passed by the Lord Chief Justice (Lord Hewart) at the Kent Assizes at Maidstone yesterday on Leonard Albert Brigstock, 33, stoker petty officer of H.M.S. Arethusa, found Guilty of the murder of Chief Petty Officer Hubert Sidney Deggan by cutting his throat with a razor on board H.M.S. Marshal Soult in Chatham Dockyard on January 6. Mr. J.C. Cassels, K.C., for Brigstock, said that the defence was one of insanity. Eileen Norah Brigstock, the accused man’s wife said her husband told her of a strange dream. He said that he saw “the devil’s mate” – a black man, an very huge. He saw his wife cowering against the side of the ship as if she was trying to escape from this black man, and he went to her assistance by fighting. The black man had nearly choked him. He got in one terrific punch, hit the side of the ship, and came to his senses. Evidence of strange behaviour was also given by two of Brigstock’s brothers, both constables in the Metropolitan Police. Dr. Hugh Alan Grierson, senior medical officer of Brixton Prison, called by the prosecution, said he had kept Brigstock under observation with a view to ascertaining his mental condition. He had shown no signs of insanity or mental disorder. He could find no evidence that Brigstock was insane on January 19 last. I shall get them sent off to you asap! Thanks for your reply. I would like the photos to put in my family history. One reason I research these terrible crimes and post them up on here is for people interested in family history. It is never a good feeling to know a family member committed such a crime but it is interesting to learn about what happened and why it happened. With your post you have given us all an insight to a possibility of why this man was able to commit this crime. Mental illness can cause many people to become violent, to react to the slightest thing because of the pressure they feel they are under. If you would like photos of these documents sent to you please pm me your address and I will send you a disc. It has been so interesting reading this information. I am perhaps ashamed to say that Leonard Brigstock was my great uncle. It has been a great insite into what was a taboo subject regarding my grandmothers brother. Leonards sister my grandmother died in 1946 and his niece my mother died in 1992. It was never spoken about and I new not to ask. However I have since been investgating my family history and my great uncles crime were revealed. However, your history forum has so much information that I am almost able to feel that I knew my great uncle. I do not condone his crime in any way, but i can say that there was a long history of mental health in the family on his side. His grandfather died and is buried in an asylum in essex, his father (gandfathers son) brutily beat him and his siblings, a niece spent time in an asylum as did my mothers brother his nephew who later commited suicide. So I feel he may not have been in charge of his sences, he still robbed a family of a father. I am a Stoker of the Royal Navy, No. K.66677, stationed in H.M.S. Arethusa, H.M. Dockyard, Chatham and serving in H.M.S. Marshal Soult. The document produced (Ex. No.10) is in the handwriting of the prisoner. On the 18th January about 10 a.m. I saw him and that document  he had it on the deck and showed it to me  he had written the word prejudice and he rubbed it out in my presence and wrote the word prestige that was on my suggestion  that being the correct phraseology. When he showed me the document the drawing of the upper head was there but I cant remember whether the remainder was. A sketch of the mess room. Grounds of Appeal or Application. I most respectfully submit this my appeal against the decision given at the conclusion of the trial against me of murder. The grounds of my Appeal are that I was not of sound mind or was in a temporary fit of insanity prior to, after, and actually at the time when the crime was alleged to have been committed. It will, it is sincerely hoped become more apparent by the facts which are contained hereon that my mind was on the verge of breakdown a whole week prior to this most unfortunate affair – caused through terrible stress and worries owing to illness – suffering and deaths running in sequence with domestic worries over a prolonged period of the last 10 years – i.e. from 1924 up to the date of this offence. That these sad events which were the direct cause of my sorry plight may be ascertained. I humbly beg that you, my Lords, will see fit to have these witnesses questioned to verify my statements. Although asked to state the full reasons which had proceeded this terrible affair I was so totally crushed at finding myself in such a deplorable position – my words failed me as did too my powers of reasoning – The very magnitude of this disaster robbed me of the human help that was striving to assist me. 1929 Sons illness at Collage Place. Theydon Bois, Essex. Sept. 1932 Wife’s distressing agonies in confinement at 10 Buxton Road, Theydon Bois and her consequent removal in a dying condition to Queen Charlottes Hosp. later transferred to Isolation Hospital where after a week she died in my own arms of General Peritonitis following a full time instrumental delivery. Death of child of that confinement and wife. During this period I was bombarded with telegrams to return to Barracks. Oct. 1932 Home (2nd) broken up after only living in it two weeks – anxiety as regards childrens welfare etc. Children placed under wife’s mothers care – also my home – etc. May 1932 Wifes mother taken ill. More anxiety for her & kiddies. Oct. 1933 Death of wife’s mother – My presence required to do all that was necessary. My kiddies left without the care essential to their health – I had to to struggle hard to retain my sanity. Jan. 1934 Managed after much trouble etc to get a home and attention for my two boys at my Sister’s Mrs. Tolhurst 5, Griffins Wood Cotts. High Rd. Epping. Daughter left with her grandfather for compassionate reasons. Aug. 1934 Re-married – in order to get settled before I went away on Foreign Service. In lodgings – 1 room. 12/- per week – Mrs. Dangley, 11, Nelson Rd. Chatham. £1 per week for boys at my sisters place. Sept. 34 Had to remove baby daughter from Grandfathers care at my old home for her health and habits were becoming impaired by the needs of better care etc. Jan 35 2 ½ years – I allowed her 5/7ths of my wages and out of this she had but 19/- to buy food for herself & Baby and to prepare for the little mite as yet unborn she would be unable to work and so augment her meagre earnings house keeping money and just how she would fare left me very distressed. The prosecution have laid stress on the point that there was a motive for this Crime being committed in that I to some extent bore malice against Mr. Deggan owing to having been reported by him for a breach in Naval discipline – this is not only entirely wrong, but a cruel lie – I will, My Lords, continue to explain facts which will prove that there was no such motive. Firstly, my duties were not confined to “H.M.S. Marshal Soult”. But to H.M.S. 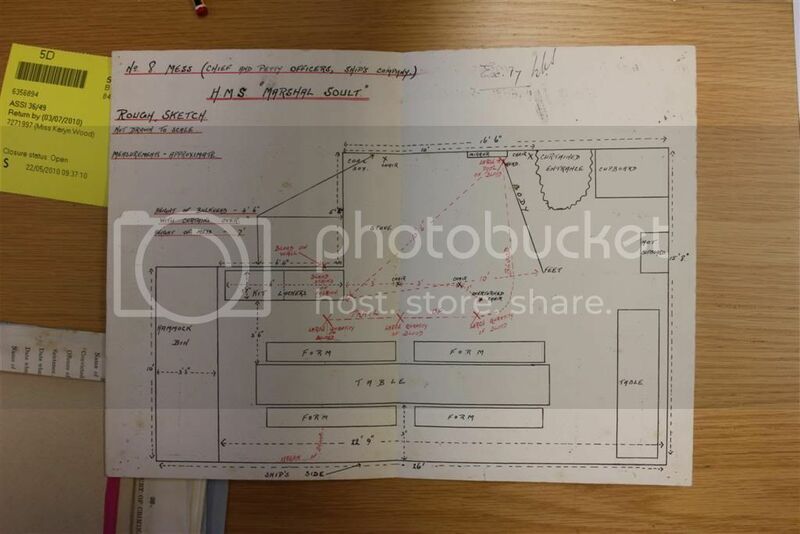 “Arethusa” under construction – my duties being in the Engineer’s Office in the Dockyard as the Engineer Commanders writer, and the daily routine of my duties was as follows:- In the Arethusa’s Office from 8-30 A.M. to 1210 p.m. and 1-30 p.m. to 5 p.m. Then home to my wife. My only duties as regarding “Marshal Soult” were that of Duty Petty Officer, entailing my having to call the men out of their hammocks at 6-15 A.M. This duty was finished with as soon as the men were out of their hammocks and hammocks stowed away. My Duty, which fell but once a week (as the P.O.s of my mess did the duties in their turn) was but a matter of half an hour. I always had my breakfast and dinner in this mess of H.M.S. Marshal Soult. Breakfast is I stopped for some from 8 a.m. (at which time, I came off from home and “ticked off” in the P.O.s liberty book on Marshal Soult) to 8-15 a.m. and thence to my Office in the Dockyard. My duty there kept me till 10 past 12 Daily – when I would again go on board the “Marshal Soult” at 12 15 to 1 p.m. for dinner – and during these 45 to 50 minutes – my routine, as can be proved, was as follows:- Dinner – wash – shave – clean boots – teeth – brush hair and clothes, and leave ship again for “Arethusa’s” Office. Arriving there at 1-15 p.m. and resuming duties till 4-45 p.m. at which time, I would cycle over to Marshal Soult’s Office and “tick off” for night leave – arriving back at “Arethusa’s Office at 10 to 5 p.m. C.P.O. Deggan partook of his meals in an entirely different mess to mine. These occasions of my going on board – did not entail my coming into contact with C.P.O. Deggan, The above duties and the taking of meals in M/Soult have only been since Aug. 24th – 1934. Less the 7 or 6 weeks she was at Portsmouth having her bottom scraped - and I and my messmates transferred to a mess in “Vindictive” being transferred to the M/Soult about the 29th Novr. ’35. It can be clearly seen then that from the total number of months (4 ½ less 2 months) of my taking two meals a day aboard this ship and the minor duty once a week, that it amounts to my having been on board this ship 2 ½ months – less 2 days per week (week end leave) (11 weeks less 2 days per week leaves roughly the total of 8 weeks). Out of this total of 8 weeks I spent 1 Hr on board per day – there being 56 days in 8 weeks – this means I actually spent (the whole of the time) 56 Hours in all on this Ship. The remainder at my own Office. “Arethusa”. I did not spend a night or ever sleep in this ship M/Soult in my life, which had been proved. I only met C.P.O. Deggan twice (re’ duties) How could I then have known him as the prosecution states? The witness for the prosecution stated that when he left at 2-45 P.M. Alfred Henry Binfield.------------------C.P.O. Deggan was alone in the mess. Glyn Charles Jenkins for the prosecution states that I came out of this mess about 2-45 P.M. and afterwards went into it again. He further states that I said “What’s a man with cross torpedoes and a star”? obviously excited and holding his wrist whilst asking this question – and that I repeated this question two or three times, & That prior to these questions I had just come from this mess where C.P.O. Deggan it has been stated previously, was alone. Does is stand to reason I knew Deggan – or bore him some long pent up grudge? I had never met or known this man prior to this short space of time spent aboard the M/Soult. I again say, My Lords, that I have never quarrelled- argued or threatened this man Deggan – nor can anyone state – and Speak the truth – say that I questioned them as to this poor mans movements – there was no reason why I should, since he and I were practically strangers. Of the repeated questions it is alleged that I am supposed to have asked “Whats a man with two torpedoes & a star”? Can it be possible that these questions could be asked by any naval rating and still be considered as sensible questions of a Sound mind? More especially so when coming from a first class Petty Officer of 16 years service. This same witness said “He gripped my wrist while asking these questions”. Is this again the actions of a sane man? Would any Sane man with a motive or intent to commit an offence of this nature have acted in this manner? 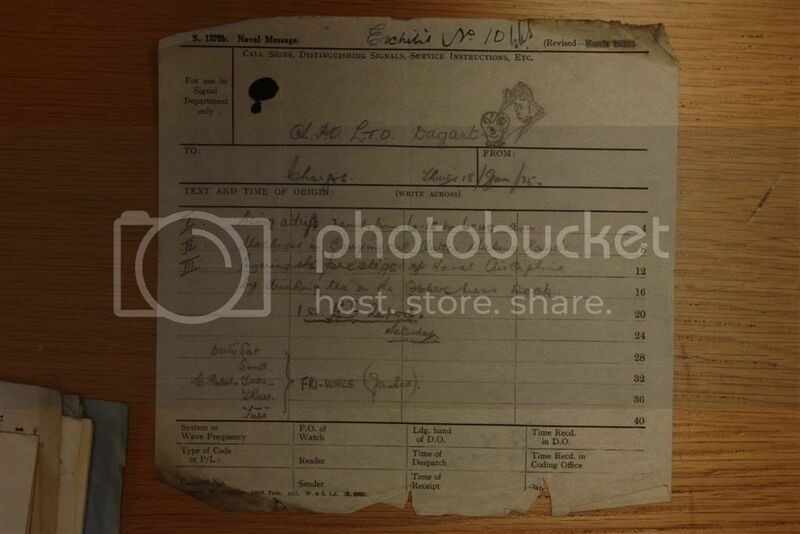 Leonard Albert Brigstock, 33, described as a stoker petty officer, of H.M.S. Arethusa, whose home address was given as Nelson Road, Chatham, was remanded at Chatham yesterday charged with the murder of Hubert Sidney Deggan, a chief petty officer, of H.M.S. Marshal Soult, by cutting his throat with a razor on board that ship on Saturday. Brigstock was wearing civilian clothes when he steeped into the dock. Superintendent F. Hickmott said that the case must be placed before the Director of Public Prosecutions at the earliest possible moment, and therefore it was not proposed to call more than evidence of arrest. Brigstock had made a statement, but that would not be put in until later. Evidence of arrest was then given by Detective-inspector Sharp, and Brigstock was remanded until next Monday, the Bench intimating that he would receive legal aid. Leonard Albert Brigstock, 33, stoker petty officer, of H.M.S. Arethusa, whose home address was given as Nelson Road, Chatham, appeared on remand yesterday, charged with the murder of Hubert Sidney Deggan, a chief petty officer, of H.M.S. Marshal Soult, of Ballance Road, Homerton, London, E, by cutting his throat with a razor on board H.M.S. Marshal Soult at Chatham on January 19. He was committed for trial at the Kent Assizes. Deggan, who had an 8in. cut in his throat, appeared to have been struck while lying on a mattress and to have staggered to the entrance where he was found. Evidence was given in support of Mr. Parham’s statement. The navel surgeon stated the Brigstock had had some drink on the Saturday afternoon, but was not drunk. Brigstock, who pleased “Not Guilty” and reserved his defence, was committed for trial at the Kent Assizes at Maidstone, on February 18. Mr. J. C. Cassels, K.C., for Brigstock, said that the defence was one of insanity. Eileen Norah Brigstock, the accused man’s wife’s aid her husband told her of a strange dream. He said that he saw “the devil’s mate” – a black man, and very huge. He saw his wife cowering against the side of the ship as if she was trying to escape from this black man, and he went to her assistance by fighting. The black man had nearly choked him. He got in one terrific punch, hit the side of the ship, and came to his senses. Dr. Hugh Alan Gierson, senior medical officer of Brixton Prison, called by the prosecution, said he had kept Brigstock under observation with a view to ascertaining his mental condition. He had shown no signs of insanity or mental disorder. He could find no evidence that Brigstock was insane on January 19 last. Mr. J. D. Cassels, K.C. (who appeared for Brigstock with Mr. H. J. Baxter) said that on January 18 last Brigstock was reported by Deggan for a deviation from duty in connexion with the discipline of the ship, and he was ordered by the master-at-arms to report on the following morning. He did so, and was taken before the lieutenant-commander. Deggan made a statement, and Brigstock was informed that the matter would be reported to the captain. Brigstock then went on week-end leave. He went home and visited with another man a public-house, where he drank a not excessive quantity of beer. Then he returned home, got a razor, went back to the Marshal Soult, made his way to the mess, found Deggan there alone and, apparently asleep, and cut his throat with such force as almost to cut his head off. Then he went into another mess, where he awakened a man and told him what he had done. At the trial the defence of insanity was set up, and evidence was given of the mental condition of certain relatives of Brigstock and also of his behaviour on various occasions. In rebuttal the master-at-arms stated that Brigstock had carried out his duties without complaint and that he had never noticed anything peculiar about him. Evidence was also given by the prison medical authorities that Brigstock showed no sign of insanity. No complaint could be made about the summing-up of the Lord Chief Ju7stice, but Brigstock wished to call certain fresh evidence. One of the proposed witnesses would say that he had served with Brigstock in ships in the past, and incidents had occurred which had led him to the conclusion that Brigstock was not right in his mind. Another man would state that on one occasion, while they were in China, Brigstock showed him a star tattooed on his chest which he said was the Star of Bethlehem, and was the emblem of a secret society to which he belonged, one of the objects of which was to kill persons whom they regarded as enemies. A third witness would be a doctor, who would say that Brigstock suffered from delusional insanity. Mr. Justice Avory, in giving the judgement of the Court, said that the sole question was whether the court should entertain the application for leave to call further evidence on the question of Brigstock’s responsibility in law the act which he indisputably did. There was no doubt that, having a grievance against Deggan, who had reported him for breach of duty, Brigstock had armed himself with a razor, had gone to the mess where Deggan was apparently asleep, and had cut his throat. After that act Brigstock made statements which showed that he perfectly appreciated what he had done. At the trial the defence of insanity was definitely raised and witnesses were called with regard to it. The jury, nevertheless, found Brigstock guilty. The Court did not sit to retry cases where there was no complaint of the mesreception of evidence, or of misdirection or non-direction by the Judge. The only course which the Court could take in the present case was to say that they could not interfere with the verdict. They did not think it right to entertain the evidence of fresh witnesses on the same subject-matter as had been dealt with at the trial. It was essentially a case on which the whole question should be considered by the Home Office, and the appeal would be dismissed. Messrs. Ellis and Ellis, the Maidstone solicitors who have acted for Stoker Petty Officer Brigstock, who was sentenced to death for the murder of Chief Petty Officer Deggan on board H.M.S. Marshal Soult at Chatham last January, were informed by the Home Office on Saturday that the additional evidence submitted by them has been considered, together with reports from two additional doctors, and a reprieve refused. The Home Secretary sees no reason to interfere with the course of justice. Brigstock’s appeal against his conviction was dismissed but the Court of Criminal Appeal on March 18. The execution will take place to-morrow. Three aeroplanes from which floated streamers bearing the words, “Stop the Death Sentence,” circled over the prison; vans fitted with loud speakers broadcast the hymn “Abide with Me”; about 50 men carried sandwich boards protesting against capital punishment; and at the time fixed for the execution a woman knelt and recited the Lord’s Prayer. Mrs. Van Der Elst addressed the crowd. Several police officers spoke to her, and then drew a cordon across the road to stop the procession f loud-speaker vans. Mrs. Van Der Elst afterwards stated that she had been up all night trying to get additional evidence on behalf of Brigstock, but had failed to get in touch with the man she wanted. She added that she would get worse and worse. She intended to get together a permanent organization, and the membership would grow. I am a F.I.C. (?) and Public Analyst for the County of Kent – at Sessions House Maidstone. On the 21st January I received from Det. Insp. Sharpe a Navy blue Raincoat (Ex. 12) a white shirt (Ex. 13) a pair of black boots (Ex. 14) A mattress (Ex. 15) a white linen collar (Ex. 11) a white handle Razor (Ex. 8) and a case containing a black handle Razor (Ex. 16). I found on the Raincoat stains of human blood in several places. There is a very large stain on the left lapel – at least 5 inches in length. There is a small red stain on the left hand side of the collar – several on the left hand chest of the coat, and on the right hand side of the coat above the top button, the second button and between the 3rd and 4th button – and several round the small bottom button. There are also blood stains round the bottom of the right cuff and also near the elbow. On the left sleeve there are stains on the shoulder and others near the cuff – stains of human blood. The white shirt had two small red stains in the front and neat the neck. The top stain consisted of human blood. The right boot had much red staining in ??? and underneath in the instep. The stains consisted of human blood. The mattress on the black side had a large red stain towards label end meaning about one foot by eight inches – and the red material comprising the stain had dripped down the red edge of the mattress. This red staining consisted of human blood. No blood was detected on the shiney side. Outside the collar (Ex. 11) and towards the left there is a red stain about 1 inch long – the stain consisted of human blood. The white handle Razor (Ex. 8) – The handle was almost covered with blood and there were similar stains on the blade – these stains both on the blade and the handle consisted of human blood. The black handle Razor(Ex. 16) the blade is covered with grease and the Razor appears to the unused. It is a companion Razor to the white Razor (Ex. No. 8) and in common with the blade of the white handle Razor it has the name “L. A. Brigstock” etched upon it. The document produced (Ex. No.10) is in the handwriting of the prisoner. On the 18th January about 10 a.m. I saw him and that document – he had it on the deck and showed it to me – he had written the word “prejudice” and he rubbed it out in my presence and wrote the word “prestige” that was on my suggestion – that being the correct phraseology. When he showed me the document the drawing of the upper head was there but I can’t remember whether the remainder was.